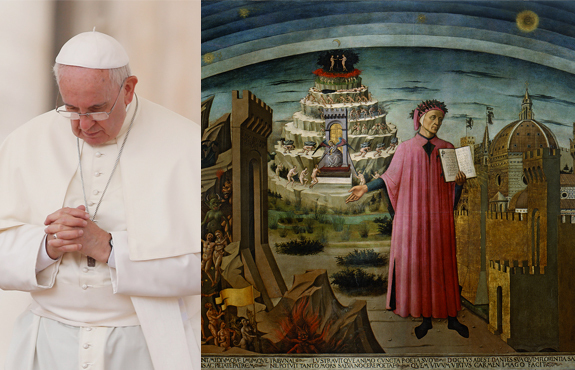 Pope Francis recently recommended Dante’s tripartite epic poem The Divine Comedy as a fitting “spiritual guide” for the upcoming Year of Mercy. For many, mention of Dante calls to mind only the first portion of his Divine Comedy—the Inferno, depicting his tour of Hell and lurid punishments for condemned souls. The poet’s graphic descriptions of eternal torments—from the fierce windstorms that plague lustful souls, to the thorny trees imprisoning the suicides—have made the Inferno, unfortunately, the most familiar of the series. In popular memory, the Inferno overshadows the two counterparts: Purgatory (Purgatorio) and Heaven (Paradiso). It is understandable, then, that some may be puzzled to hear that Dante is recommended reading for the Year of Mercy. Dante? The man who wrote about the seven circles of Hell? With the sinners writhing in agony and the gargantuan frozen Satan at the end? But Dante’s tour of Hell is merely a prelude to his breathtaking, eye-opening journey through the redemptive climb of Purgatory and the divine dance of Paradise. 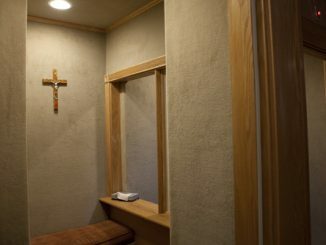 Dante is, as Pope Francis explained, “a prophet of hope, herald of the possibility of redemption, liberation and the profound transformation of every man and woman, of all humanity.” Dante’s trilogy is deeply imbued in a world-shattering vision of God’s mercy in action, of His redemptive grace saving souls who will accept it. If Dante’s character more than once expresses surprise at who has chosen Hell, he also is frequently surprised at who has accepted the mercy of God. The oft-misused and misunderstood phrase “Who am I to judge” fits well with Dante’s understanding of salvation: only God can pass final judgment on a soul, and our earthly presumptions about others’ salvation can be quite wrong. And while giving plenty of attention to politicians, patricians, and even popes, Dante also filled his Divine Comedy with ordinary people: sinners, repentant souls, and saints. It is not only the famous or the canonized, Dante insists, who receive God’s boundless mercy. And there at once my sight and speech were gone. and fell, and left my flesh to lie alone. It’s truth I tell—tell it to all alive! Implicit here in Dante’s vision of God’s mercy is man’s wholehearted repentance. The souls in Purgatory undergo purification gladly, because they are truly sorry for their misdeeds and wholly open to God’s purifying mercy. Mercy opens the gates of Heaven—but is contingent on repentance. Heaven’s gatekeeper tells Dante about the keys: “Peter’s they are, who said that I should err / rather in opening than in keeping shut, / so long as men should kneel before my feet” (Canto 9, lines 127-29). God’s mercy completely washes away sin: “Thanks to Jesus, God lifts her many sins off her shoulders, He no longer remembers them,” says Francis, “For this is also true: when God forgives, He forgets.” At Purgatory’s edge, before he enters Heaven, Dante passes through the river of forgetfulness, Lethe, symbolizing how a redeemed soul’s past sins are completely washed away by God’s forgiving love. Pope Francis made no mistake: filled with such powerful images of mercy, Dante’s Divine Comedy is certainly fruitful reading for anyone who, like the sinful woman, hopes to see mercy in the face of God.